Mystery Monday is swinging across the pond, all te way to Norway this afternoon! This translated Norwegian book will introduce you to an amazing voice in Norwgeian mysteries! Varg Veum receives a surprise visit in his office. 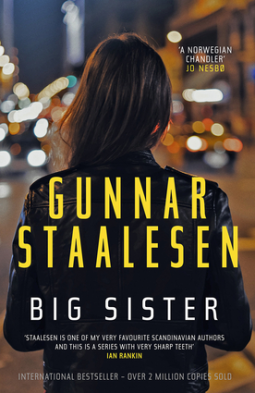 A woman introduces herself as his half-sister, and she has a job for him. Her god-daughter, a 19-year-old trainee nurse from Haugesund, moved from her apartment in Bergen two weeks ago. Since then no one has heard anything from her. She didn't leave an address. She doesn't answer her phone. And the police refuse to take her case seriously. Veum’s investigation uncovers a series of carefully covered-up crimes and pent-up hatreds, and the trail leads to a gang of extreme bikers on the hunt for a group of people whose dark deeds are hidden by the anonymity of the Internet. And then things get personal. Sometimes translated books are spectacular (check out all our previously reviewed ones on this blog!) and sometimes they loose something in the translation. This book seems like it will be the latter when it starts, but you soon realize it the manner of writing, not the translating, and that it's a 'Norwegian thing'. Having done genealogy research in Norwegian books and records, I know they can lean toward being dry, tough in person, my cousins have been anyting but! So keeping that in mind with reading this book, I quickly realized to just stay with the book, to see how it played out and was soon GLAD I did! This book seems to be straightforward. But when the bodies start piling up, and there doesn't seem to be a straight story, or fact, around, Varg soon realizes e has taken on a case that has more than just a simple answer, and that may give him answers he didn't want to know about is own life and family history! The convulted twists and turns will have you stopping and saying "wait did I miss that clue? ", and then realizing like Varg, things were not as they seemed! About halfway through the book it turns into a roller coaster of a read and I can't wait to go back and read the previous books in the series! If you're looking for a new author/series to take up this Fall, this just might be the one you're looking for! Gunnar Staalesen published the first Varg Veum book in 1977. He is the author of more than 20 titles, which have been published in 24 countries and sold more than four million copies. Twelve film adaptations of his Varg Veum crime novels have appeared since 2007. Staalesen, who has won three Golden Pistols (including the Prize of Honour), lives in Bergen where there is is a life-sized statue of Varg Veum in the city center. Don Barlett has translated books by Jo Nesbø, Karl Ove Knausgaard, and Per Petterson.